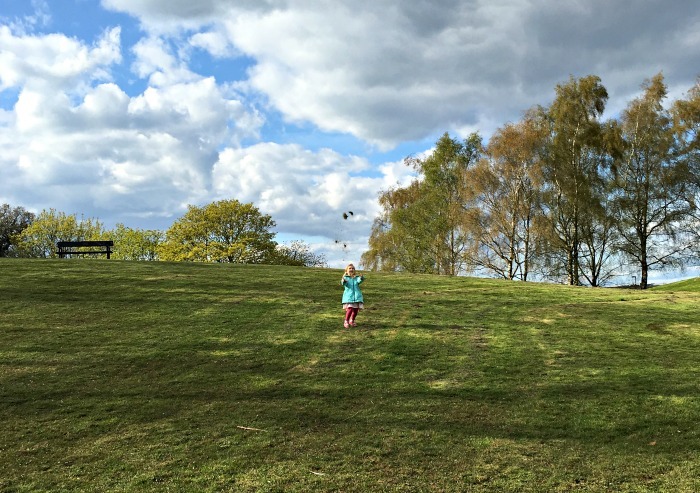 Yesterday we decided to head out to a nearby park and adventure playground. For the last few weekends we have been busy digging up our garden ready for re-landscaping, and it's taken up most of our free time. So yesterday, after another few hours work, we decided to give all of us a break and dust of the cobwebs with a little trip out. Becky loves this hill, and every time we go there, the lawn has been freshly mowed and has that distinct, deliciously springy smell. Becky kept picking up little bits of grass, singing, giggling, jumping round and throwing them in the air - just enjoying life. Thank Goodness for kids to reminds us of the small pleasures in life! Love it when we can get out and about like this, running around is the best!